Option 1: Visit the USCIS Glossary for a ton of terms that you probably won’t encounter. (Here’s the link: https://www.uscis.gov/i-9-central/customer-support/glossary-terms.) Sure, it’s useful but unless you run across I-20, I-94, H-1B, L1’s all the time…. you’re going to be looking them up anyway! Option 2: Check out our essential list of terms below! Frankly, I’d go with Option 2! It’s simple and focused. 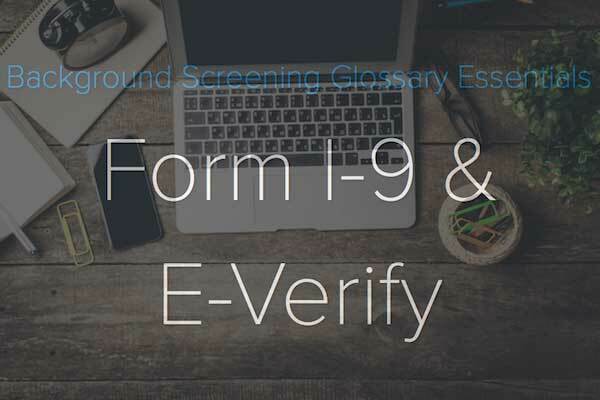 Choice has hand picked these need-to-know terms related to Form I-9 and E-Verify. E-Verify – An online application maintained by USCIS to electronically verify employment eligibility with SSA and DHS based on the information from a completed Form I-9. E-Verify Integration – Application that has direct integration into the USCIS E-Verify that meets USCIS regulatory and compliance standards. Form I-9 – Employment Eligibility Verification form established by USCIS. This form is mandated by federal law to be completed on each new employee hired after November 6, 1986. ICE Audit – Audit of an employer’s Form I-9 and E-Verify performed by US Immigration and Customs Enforcement (ICE). Immigration and Customs Enforcement (ICE) – Federal agency that, among other duties, enforces lawful use of Form I-9 and E-Verify. Notice of Inspection (NOI) – Notice provided by ICE to employers informing them of an upcoming inspection and compelling employers to produce Forms I-9 and supporting documentation, usually within three business days. Notice of Intent to Fine (NIF) – Notice given to an employer by ICE identifying errors/omissions with Forms I-9 following an audit. For additional details, contact your legal counsel and refer to https://www.ice.gov/factsheets/i9-inspection. SSN Verification & Address History – Verifies the name associated with a SSN and retrieves address history from a variety of sources. Additional information may include year of birth, date of birth, Death Master Index, and issuing state. Note: this is not the same as verifying employment eligibility as part of Form I-9 or E-Verify requirements. United States Citizenship and Immigration Services (USCIS) – Federal agency that operates and maintains the official E-Verify portal, which is integrated into Choice Screening Form I-9 ComplyTM online management tool. Violations, Form I-9 – Violations uncovered during an ICE Audit that may result in monetary fine or criminal penalty. Fine penalties range from $110 - $16,000 per violation. Criminal penalties up to 6 months in prison. For additional information, visit https://www.uscis.gov/i-9-central/penalties. Good start, right?! All these terms and more are in our one-stop Background Screening Glossary! It’s free to download so check it out! Before you leave, it’s worth mentioning there is a stark difference between a SSN Verification and Form I-9 and E-Verify. SSN Verification (the background screening service) accesses information from the SSA via credit bureaus and various other sources, but not DHS. Form I-9 is a specific form required by the federal government to be completed on all new hires after 11/6/1986 without exception. E-Verify is an application developed by the federal government to electronically verify employment eligibility directly via SSA and DHS. Failure to completely realize these differences and correctly utilize the right service at the right time can put employers at great risk for audits, fines and even criminal charges. Choice Screening’s Form I-9 ComplyTM brings you electronic Form I-9 management that fully integrates with E-Verify. Not only is our application totally compliant and created by immigration attorneys, no employer has been fined for errors and omissions since using our application. Don’t risk it – learn more about Form I-9 ComplyTM today!